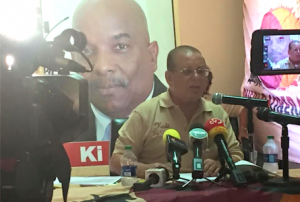 WILLEMSTAD - Elmer Wilsoe, former Minister of Justice and currently a Member of Parliament for the ruling party Pueblo Soberano (PS), denies any involvement in the murder of his former party leader Helmin Wiels. Wiels was murdered more than three years ago at the Mari Pampoen beach east of Willemstad. On Tuesday the Public Prosecutor on the island revealed that Wilsoe was considered a suspect since 2014. Wilsoe had an appointment with Wiels on the day of his murder. In a press conference held yesterday at the party headquarters in Marchena, Wilsoe stated that the Public Prosecutor has no evidence and that the accusation is based on gossip – Wiels’ brother Aubert said Wilsoe was involved, but gave no evidence. Wilsoe plans to demand compensation for defamation and will not attend any parliamentary meetings for now as suspects do not belong in parliament. First, he announced that he will resign, but a day later he indicated that he will just stay away from the meetings. The murder investigation is still ongoing. In addition to Wilsoe, two other former ministers are also suspects in this case – George Jamaloodin, formerly Finance Minister, and Carlos Monk, former Minister of Education. All three were members of the government headed by former Prime Minister Gerrit Schotte.